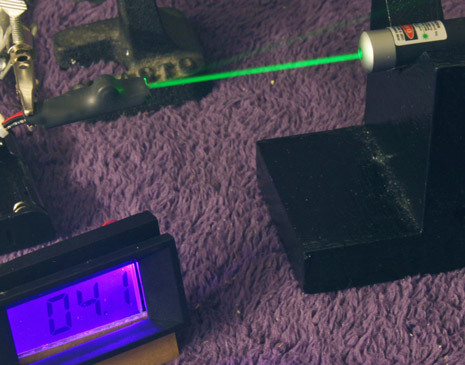 Several months ago I set out to measure the powers of all my lasers. What seemed like a simple process became a protracted hassle. As with my Dirod electrostatic generator I made a number of mistakes. First the DVM module that I had on hand wouldn't work so I had to buy another one. Next I discovered that the power sensor and DVM grounds have to be separate so I had to come up with another power supply for the DVM. Then I discovered that the IR output from the DPSS lasers was so high that I needed a filter in order to measure the visible output alone. Finally, I checked my meter's sensitivity using the supplied test circuit. That last thing didn't get done because I was futzing around with everything else. When I finally got around to it I discovered that I needed to use the power sensor's built-in shunt resistor to get accurate readings. 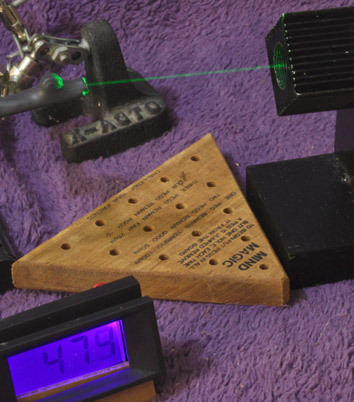 The next thing I acquired was a 200mW Calibrated Laser Power Meter Sensor from Lasersbee. 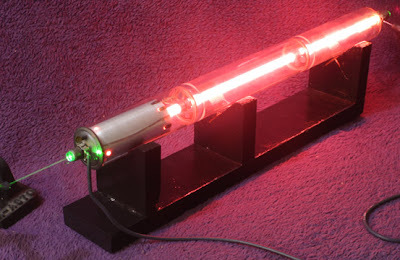 You simply attach it to a Digital Voltage Meter and the reading in millivolts is the power of the laser. The power sensor is calibrated for 650nm lasers. For other wavelengths a conversion chart is provided. To make things look cool I bought a back-lit DVM module from Jameco. I found that the sensor and the DVM module need to have separate power supplies to work properly together. Right now I'm using batteries. For the sensor I got a lithium 9V from the local Batteries Plus store. It should last forever as far as this project is concerned. The DVM module is running off of AA batteries. Laser pointers are a very popular item these days. They're cheap and the green ones are very bright to the eye. I got mine from DealExtreme, one of those "buy direct from China and wait four weeks for it to arrive" places that have sprung up over recent years. Despite the delay everything I've bought from them has been a really good deal. Note that they do offer a lot of junk so caveat emptor. (I don't think I'll be buying any of their condoms.) There are also tons of laser pointers for sale on ebay but it's a crap shoot. Most of the sellers say "5mW" and then lead you to believe it's actually a lot higher. They often take a 5mW and crank the power up. It works—for a while. Take a look at their feedback before you buy. 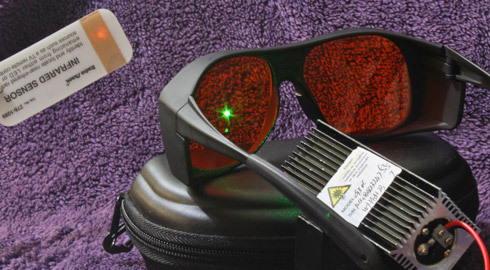 When it comes to diode lasers you typically get what you pay for. In some countries you can't import lasers at all so check before ordering. 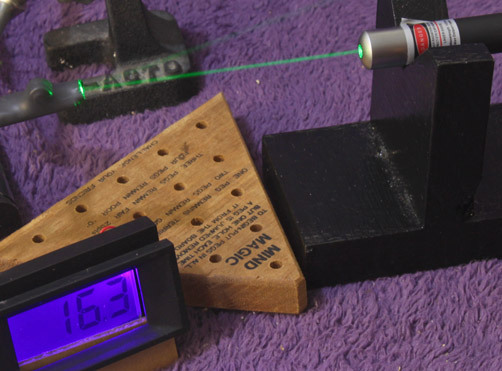 Here in the US you can't import laser pointers >5mW so don't bother ordering anything rated higher. You can, however, buy domestically manufactured "laser parts" of virtually any power. See Mad Science For Sale for dealers. I used a fog machine to make the beams visible in the following tests. The density of the fog varies so the brightness of the beam doesn't correspond to the actual power. Also, these are 5 second exposures so the digits on the meter change and blur the readout sometimes. This works out to about 25.5mW give or take the error range. The correction factor for 405nm is so high that the error range is quite large, ± a couple of milliwatts. As it happens, a friend of mine tested this laser with his pro-quality meter (with a pyrometer) and got exactly 24mW so I'd say we're doing pretty well there considering the limited accuracy. And 24mW is a bit higher than 5mW so I definitely need my googles on when working with this one. Shame on Dealextreme for offering 5mW and delivering 24mW. Next up are the diode-pumped solid-state or DPSS lasers. 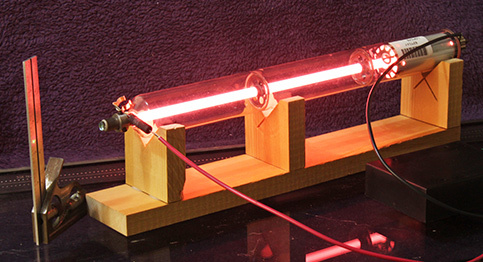 They consist of two IR lasers and a frequency-doubling crystal. 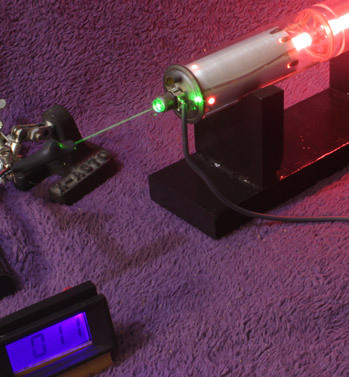 An 808nm laser pumps a 1064nm laser and its output has its wavelength halved to 532nm. The major hazard of DPSS lasers is that their efficiency is less than 100% so there's plenty of invisible infrared light being emitted. At 5mW or less this is not considered a hazard, but at higher powers it is. Remember, you can't see it so you don't know how bright it is or where it is. Because of this, DPSS lasers over 5mW should have an IR filter on the output. None of these cheap pointers of Asian origin have any discernible IR filtering. See this video for a demonstration of the problem. Note that you can also find videos that show how to disassemble a pointer and increase the power, burn things, etc. You're on your own with that stuff. This filter is perfect. It passes 97% of the green and practically none of the IR. 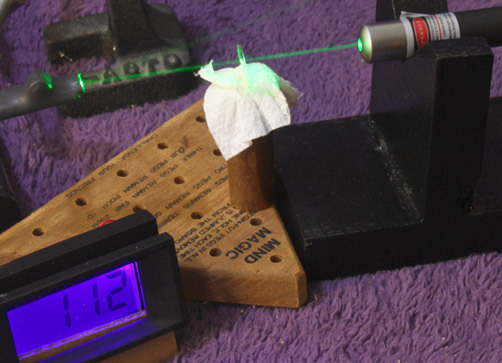 True, I had some trouble finding a way to mount it with the angle of incidence to within ±5°. But I'm going for ballpark measurements here. It finally occurred to me that any assumptions about the absolute power of the IR emissions from these lasers are unfounded. 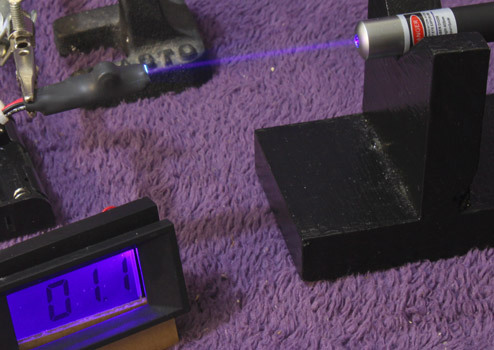 The relative levels of the 808nm and 1064nm lasers are unknown to me. The Laserbee sensor has two different correction factors for the two IR wavelengths—one greater than one, the other less than one. If the ratio of the two were constant then the calculation could be made. When I find out more I'll update this article again. Unfortunately, I didn't manage to get a decent picture with the IR filter in place but the reading was 1.1mV, which about 1.8mW. With a reading of 4.1mV with all three wavelengths combined, obviously there's a lot of IR emission here and the visible power is well below 5mW. About 11.2mV (18.25mW) visible. Lots of IR. Say, wasn't this supposed to be "≤5mW"? Heh. About 60.6mW visible. Clearly this laser has some IR filtering but I can't tell how much. 50mW is very bright. I had to wear safety goggles to align the beam. Next time around—lasers of the visible red kind. You have a fantastic blog, great information and honestly I am amazed at the setup(s) you have for your experiments. I wish that I had the time and $$ to do similar work. 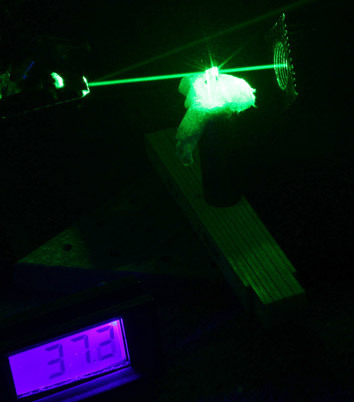 Power testing of the laser has been improved for the success and triumph of the people. The testing is completed for the use of the essay ace reviews options for the humans. The doctors have been involved in the main scheme for the use of the instruments or the humans in life.